If your students struggle with standard deviation, statistical tests and logarithmic functions, this is the book for them. 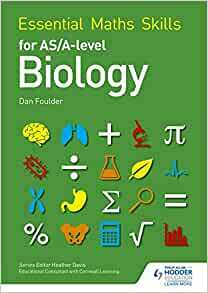 This textbook companion will help improve their essential maths skills for biology, whichever awarding body specification you're following. You can use it throughout the course, whenever you feel they need some extra help. Don't let your students miss out on easy marks, prepare them for those Maths questions with this essential guide. 5.0 out of 5 starsmoney well spent! With above level 2 GCSE maths questions accounting for 10% of the 3 OCR A Level papers, (with additional maths questions included that are below level 2, thus increasing the % of maths questions to above 10%), every student revising for their OCR Biology exam should be working on maths problems relating to the A Level Biology course. This book is expertly written with detail: explanations, worked examples, practice questions for each of the 25 chapters and a few exam Qs included at the end. The requirements for the AS and A Level courses are identified. It assumes no knowledge, making it ideal for students who lack confidence in their maths skills. However it allows those completing A Level Maths to improve their skills in answering Biology related questions. The answers to the questions, that include an explanation of how the answer is derived (often unlike the exam board mark schemes), is easily available via the Hodder site (i have checked). While the book is not written just for the OCR specification, I will be recommending this book to my Year 12 and Yr 13 A level OCR students. Useful little text. Would recommend!